I’ve been plugging away working on projects that I have either stored up from the winter or have an acquired during Thrifty Friday outings. Recently, I painted a cedar chest, and freshened up a tired mirror. I’m feeling good! I can see progress, that’s always motivating. I don’t know what came over me but I was very much in a groove. So much, that I neglected to take photos of my work until they were totally completed. Yikes! 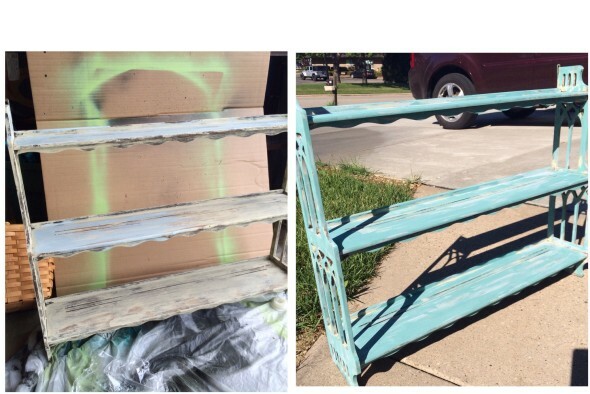 So I’ll just continue by showing you how DIY chalk paint can transform furniture and what has been completed. I had a place in my kitchen nook area that I call my office that would fit it perfectly. Home it came and on the wall it went and sat … empty. I just wasn’t feeling it. It sat there on the wall for quite a long time until I found a replacement. In its place I hung a calendar and into the garage it went. During one of my productive painting sessions, I decided to change out the color of the shelf. 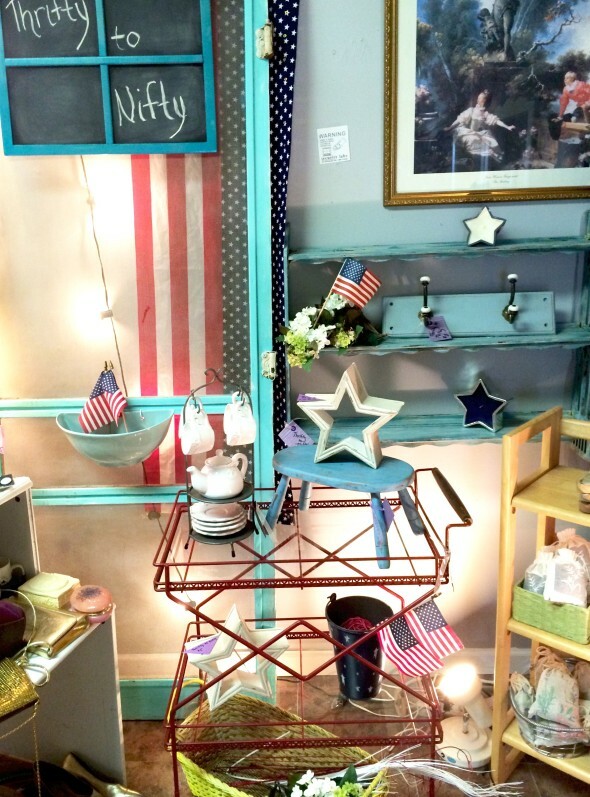 This time I was experimenting with DIY chalk paint and tried it on the shelf. I also tried it on a few other items, all that I don’t have before pictures for. The DIY chalk paint worked well and covered the shelf, a step stool, and wall hooks. All these items went on display for sale. Do you notice the cart? It was from my coffee station post a while back and the stars from a garage sale haul . Combining all these pieces made a quick, 4 of July display. If you want to find out more about what’s happening here, I shared some exciting news on Thrifty to Nifty’s Facebook page. It fabulous to get some pieces out of the way and the DIY chalk paint worked great. I think it might be time for some shopping. What have you found and painted? The transformation is so crazy! Love chalk paint, I discovered it a few months ago, but since I live In the boondocks there is none here, so I also make my own! Yes, I am so glad I dicovered it. I must have been living under a rock, because I had never heard of chalk paint until about a month ago, and now it’s everywhere! Thanks for sharing the link to the recipe, and for joining us at Talented Tuesday! Yes give it a try. It is very user friendly… And fun! Congratulations those projects have turned out lovely and now paying you back. It so much better to make your own. Then it’s loved extra !! I love thrift shopping! Your pieces are really nice and I can see why that shelf wanted to come home with you. It wanted a little love and it got it! Very pretty! Great transformations! Chalk paint has become my go to paint for lots of projects recently. 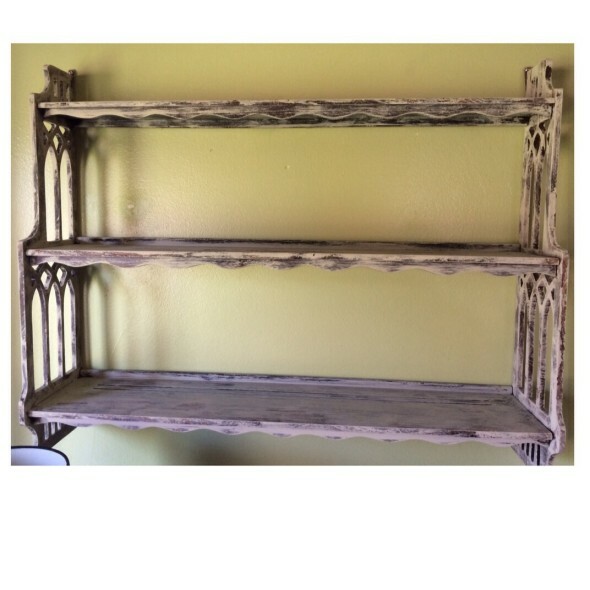 I found a great wall shelf at a thrift store, too that I painted using DIY chalk paint. Congrats on your venture into selling! I have heard that chalk paint takes a lot of time but it is so worth it. Thanks for linking up this week on #HomeMattersParty hope you will come back next week and link up again. It turned out beautifully, of course! How do you find time to complete all these fantastic pieces?! I have a dresser I’m getting ready to paint and I wondered how well DIY chalk paint worked. I’m glad I came across this post so I could see the finished result, I’m going to give it a try! Congrats! I’ve always known you should be selling your pieces. You’re awesome! How fun….and I immediately noticed the red cart, too. I checked out your link to your FB page and saw your news. All that Thrift shopping is finally paying off. So so very happy for you. Zan I can always count on you for noticing the little things. Thank you for that!